CINCINNATI -- A homeless encampment moved from Downtown to Pendleton overnight to comply with a judge's order. Then the judge changed the order. And advocates say they won't let Mayor John Cranley and other city leaders sweep them under the rug. Cranley sought Hamilton County Prosecutor Joe Deters' help last week after an unsuccessful effort to remove a camp along Third Street. Deters took the issue to court Monday, getting Common Pleas Judge Robert P. Ruehlman to declare the Downtown camps a nuisance. He issued a temporary restraining order that directed the city to close them down. Initially, the order applied to any encampment south of a line drawn from roughly the Mill Creek to Mount Adams, so many in the camp moved just north of that line. 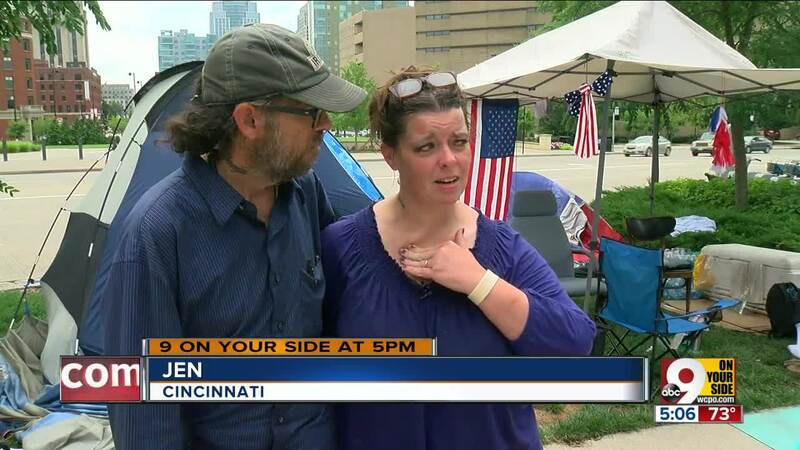 They set up their tents on public land near JACK Cincinnati Casino, another major entrance to the Downtown area. Then Tuesday, the judge agreed to a larger boundary, containing the area between Interstate 75, Interstate 71 and the Norwood Lateral. 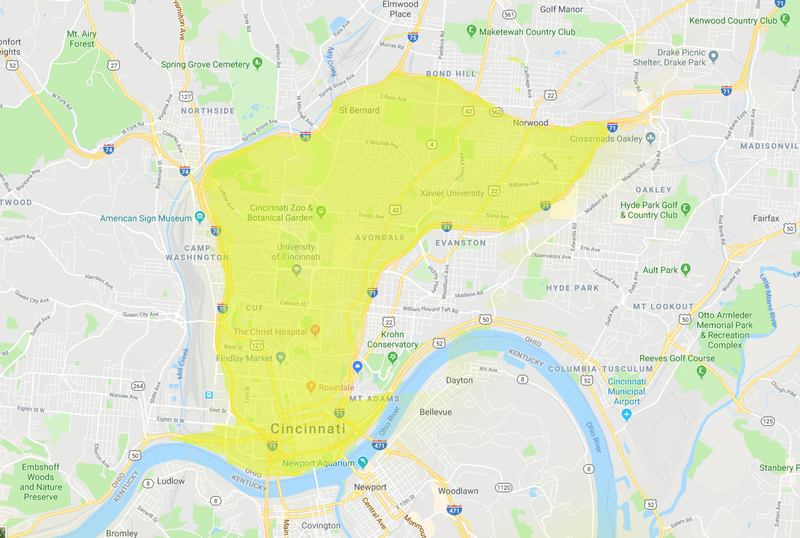 That includes Downtown, Over-the-Rhine and Uptown, but not places like Mount Adams, the Price Hill neighborhoods, Hyde Park or Sedamsville. The new boundary mostly follows I-71, I-75 and the Norwood Lateral. 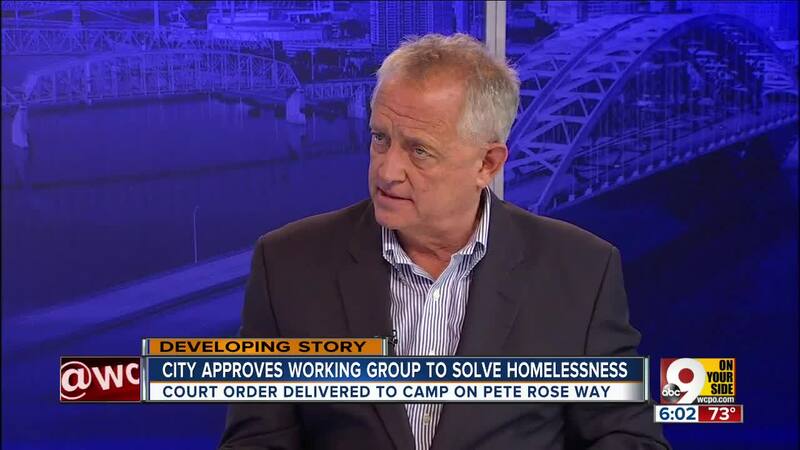 Deters told WCPO the purpose of the injunction in the first place was to encourage the people staying outside to go to shelters that could help them. "And they chose to go right by the courthouse and pitch their tents there. So, eventually, I think they're going to get the message that you can't just pitch tents on public property," he said. "We have a common pleas court judge who has said you can't do that, and that's what happened yesterday. ... So we filed again and expanded the geographical area where it's effective." It's not immediately clear when police will move in to clear the new camp near the casino. "It's like this: Y'all want us to keep moving, and we'll keep moving. But you got to realize: Now we can't hide. So the more you move us, the more you will see us," said Bison, a homeless man who said he is the leader of one of the camps. Few people remained along Third Street when police arrived Tuesday morning; there were no arrests there, or at another camp near the Lytle Tunnel, on the east side of Downtown. Deters and Cranley both said they're sympathetic to the plight of people experiencing homelessness, but that those people are best served in shelters. The Greater Cincinnati Homeless Coalition countered that there's not enough space. "People in shelter, doubled-up and living outside are seeking employment against great barriers, and those who have obtained employment are earning a wage, but still are not able to afford housing," the Homeless Coalition said in a statement. "People are on waiting lists for housing assistance and are seeking every positive way out of being without a home." A recent survey of Downtown residents and business owners showed concern for the city's image due to the camp. Now the Downtown Residents Council is asking the city to be included in the discussions moving forward that involve the camps. The Homeless Coalition argued Cranley and others would prefer the homeless be out of sight. The group has a pending lawsuit, alleging the the city is violating residents' constitutional rights. 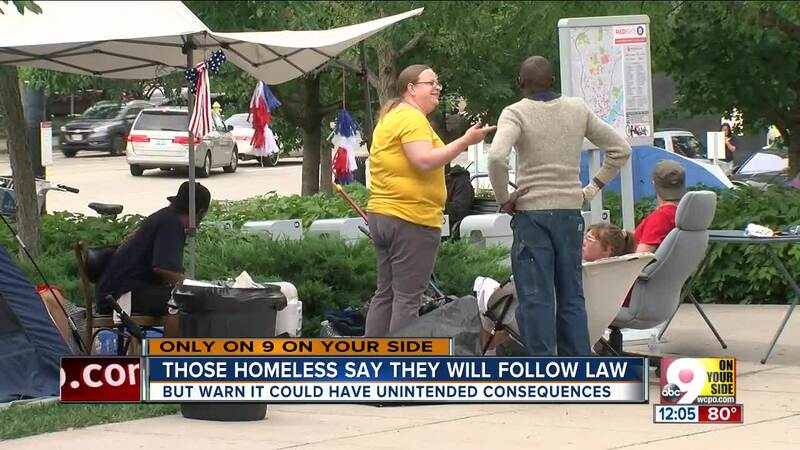 "What our ongoing lawsuit is challenging is the constitutionality of using Ohio's criminal trespass law to remove people who have stayed in public spaces," said Bennett Allen, the attorney for the Homeless Coalition. Sidewalks are traditionally public forums, and the people living along Third Street or anywhere open to the public are "engaged in symbolic political speech calling attention to the City's affordable housing crisis," the suit says. The suit alleges removing people from the Third Street camp violates their "First Amendment right to speak in a traditionally public forum." Removing people from the camp due to health risks "is not a compelling government interest" without any evidence of a public health threat, the lawsuit says. The advocacy group Maslow's Army held a news conference Tuesday to clarify its mission, with co-founder Samuel Landis stressing that Maslow's Army is working to help people out of homelessness, not keep them on the streets. Since October of 2016 the mission of Maslow's Army has been that no one should spend another night on the street. We work continuously with weekly engagement events that not only meet the immediate needs of those experiencing homelessness in Cincinnati but provide the opportunity to connect with community services that can break the cycle of poverty, treat addiction and mental illness and create stable and sustainable environments that get members of our community off the streets. In recent weeks the issues of homelessness in Cincinnati have been pushed to the forefront of the minds and hearts of our neighbors and leaders. Maslow's Army wants to be clear in our desire to end homelessness in Cincinnati. We stand against any efforts by organizations that would seek to perpetuate conditions of homelessness in our city and we stand with community and civic leaders and with organizations that share our goal of providing opportunities that get people off the street. We support the efforts of the City of Cincinnati, Hamilton County and community organizations to connect those experiencing homelessness with these vital services that create safer and healthier situations for the community members that we serve. We look forward to continued work with the City of Cincinnati, Hamilton County and our growing list of partners, as we work toward ending homelessness in our community. Landis said Maslow's Army would continue to go to the camps to try to help meet people's basic needs and to help connect them with services to help them get off the streets. Homeless Coalition Executive Director Josh Spring said that is his organization's goal, too. He said the coalition hasn't been encouraging anyone to remain homeless and that it's insulting to think anyone would stay on the streets because someone told them to do that. "If homelessness were not a problem, then as a city we wouldn't be having this discussion and this debate. And homelessness is a problem," Spring said. "Our mission is to eradicate homelessness, and we know that is not done by hiding people." Bison echoed that sentiment, saying that pushing the camps out of view won't solve the problem. "Stop being funny. Open up more programs," he said. "Stop shutting down subsidized housing, and let people get some help for real." A woman who goes by Sunshine said moving the camps away from Downtown also moves people farther away from the services they need. 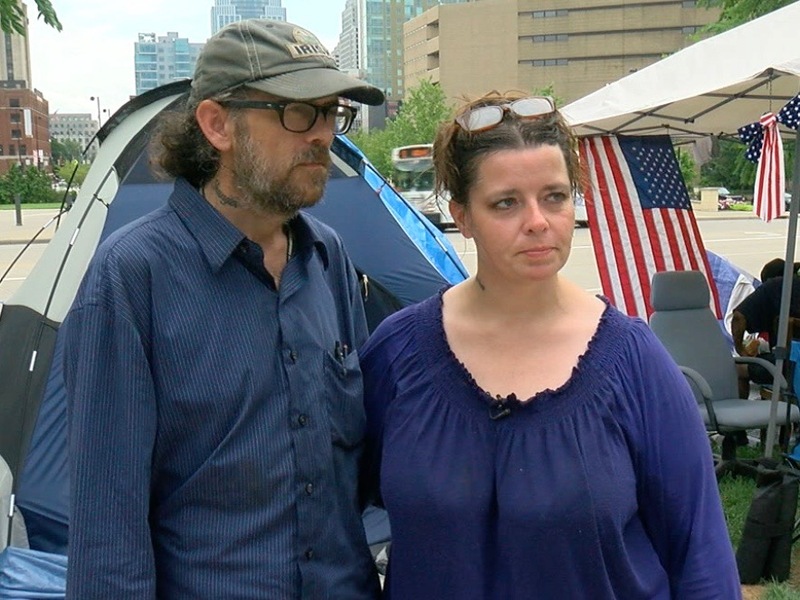 "Just keep pushing, pushing everyone out and away further and further," said Sunshine, who was staying in a tent across from JACK Casino with her husband, who goes by Darkness. "No matter where they push and where they make the line and where everyone goes, somebody's going to get angry and say why are these tents out here? Why are these people here?" A Cincinnati City Council committee took action Tuesday afternoon, approving a motion that seeks to form a working group to address the issue. The motion calls for the group to include representatives from the city and Hamilton County as well as people from the homeless camps and Downtown residents, among others. It gives the group 60 days to come up with a plan for people who can't, or won't, go into shelters. "This is something I'm laser beam-focused on," said Councilwoman Tamaya Dennard. "People want a solution tomorrow, and it's not going to happen tomorrow." But that's why the 60-day deadline is so important, she said. The full council must approve the motion before it goes into effect. But because it has the signatures of six council members, Councilman Greg Landsman asked for work on the matter to begin as quickly as possible. Lucy May writes about the people, places and issues that define our region - to celebrate what makes the Tri-State great and shine a spotlight on issues we need to address. Poverty is an important focus for her and for WCPO. To read more stories about childhood poverty, go to www.wcpo.com/poverty .